by Salena Zito and Brad Todd. The Great Revolt by journalist Salena Zito and political strategist Brad Todd is chock-full of interviews, anecdotes, and travel notes, as well as a mound of statistical and demographic data. All of it comes together quite effectively, but all of it is made redundant by that single sentence. That is why Trump “happened.” That such a simple, natural, and human sentiment—a loyalty to place, family, the currents of life, a skepticism of distant technocracy—is unintelligible to so many political observers should concern everyone. 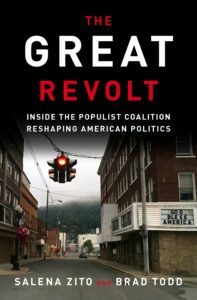 The Great Revolt consists mostly of interviews with a variety of Trump voters in post-industrial and rural heartland counties in states like Ohio, Wisconsin, Pennsylvania, and Michigan. Zito and Todd divide the voters into several categories, each with a particular attribute that drew them to Trump in a way that the media and the Clinton campaign largely missed. There are, for example, the “Girl Gun Power” voters, women who view self-defense under the Second Amendment as an important component of feminism. There are the “Rotary Reliables,” affluent voters at the top of the social structure in their small towns, who didn’t personally love Trump but were inspired by his popularity among their less affluent neighbors. The categories are interesting, though they often bleed into each other. The point is that Trump put together an unusually broad coalition, but there are still common threads throughout. These critical voters, who flipped the Democratic “Blue Wall” red, generally feel rooted to their community, loyal to their family, and skeptical of elites and standard-issue politicians. Almost all of them value hard work and an economy in which hard work can get you ahead. Thirty-five counties in Ohio, long the nation’s premier presidential bellwether, swung 25 or more points from 2012 to 2016. Twenty-three counties in Wisconsin, thirty-two counties in Iowa, and twelve counties in Michigan switched from Obama to Trump in the space of four years. Trump only carried 3 of the nation’s 44 “mega counties,” places with more than one million in population, and only 41 of the nation’s 129 “extra large” counties with more than 400,000 but less than one million. Trump made up for those staggering losses by running up overwhelming totals in smaller counties, many of which are losing population and have seen better times. “Populism is not just a subject to study for us,” Zito and Todd write. “It’s a worldview we understand genetically.” That worldview, like any other, is not the same thing as the truth. But too much coverage has either ignored it, or cynically treated it as an insincere cover for bigotry, resentment, or racism. It’s possible that alt-right trolls, Russian social media campaigns, and plain old racism motivated some Trump voters, perhaps even a non-negligible number of them. But that is far from the whole story. There is resentment, to be sure, and there is some paranoia as well, à la right-wing talk radio or Alex Jones. But there is also nostalgia and wistfulness and poignancy. The main takeaway from all of this actually has little to do with Trump or even with politics. It is about the state of the country in a macro sense. Voter after voter speaks with nostalgia about a diner, a tavern, a factory, a once-bustling main street. Town after town is described as a place of has-been and once-was. The reshuffling of industry and population, the growing pains and shrinking pains, are structural realities in a large country undergoing creative destruction. Nostalgia for plentiful jobs, middle-class stability, and an industrial-era work ethic runs through The Great Revolt. The interviewees do not make excuses for themselves, but perhaps they should be afforded some. The left has a tendency to explain individual choices through structural factors. Terrorism, for example, is understood as blowback from American intervention, or induced by famine and climate change, as though jihadists were merely atoms reacting, in Newtonian fashion, to outside forces. But there are no structural excuses for Trump voters. This raises, of course, the question of whether Trump can actually bring back the midcentury middle-class glory days. Quite likely not. Zito and Todd merely make sense of why people voted for Trump. They do not suggest that he can fulfill all of the wishes that were poured into him. It may very well be, à la James Howard Kunstler, that the widespread affluence of the fifties was a tiny, highly irregular blip in human history, and that we are slowly adjusting back to the norm. Nothing says that towns and cities must indefinitely remain thriving and fully populated—indeed, quite the opposite. The Trump phenomenon may be the first intimation of politics colliding with the realities of degrowth and a lean future. The irony is that this constellation of ills may not be far behind the elite coastal vanguard that views Trump voters as throwbacks to the fifties. The gig economy, startup culture, and all of the dislocation, transience, and insecurity that comes with it isn’t really all that different from holding down three part-time jobs in a shrinking Rust Belt town. The more one ponders all of this, the more Trump himself recedes into the background as a skillful and lucky self-promoter who jumped into politics at the right time. His voters and their concerns, however, are likely to be with us for a long time to come. The election of Trump, Zito and Todd write, may be “the first success of a coalition that is not likely to soon separate.” What that means to you may tell you everything you need to know.